Nintendo have today launched the ‘Make Your Own Zelda Flipnote’ competition, for which they’re looking for the best Zelda-inspired Flipnote animations across the globe through the Nintendo DSiWare software, Flipnote Studio. Flipnote Studio allows Nintendo DSi and Nintendo DSi XL owners to create their own unique, short animations which can then be viewed online. This latest competition, created to mark The Legend of Zelda’s 25th Anniversary, opens for entries today with a closing deadline of September 9th 2011. 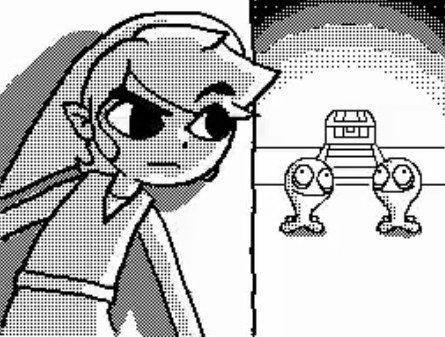 You’re invited to create your own animated Zelda Flipnote, which may celebrate memorable scenes, unique characters and challenging puzzles from franchise history. You’ll be able to use one of a few provided sample flipnotes, to then unleash your Zelda creativity. Each entrant will be able to submit a single animation that will then be judged by key members of the Nintendo Co. Ltd. development team that have been closely involved in creating The Legend of Zelda series. This will include Takashi Tezuka, Eiji Aonuma, Yoshiaki Koizumi and Shigeru Miyamoto, who will each choose the most original creative flipnotes that will then be posted on the Nintendo homepage, Flipnote Hatena on Nintendo DSi and Nintendo DSi XL and the Nintendo Channel for other Zelda fans to enjoy.